Rapid world industrialization has resulted in an overburdening demand for refined fossil fuels. This demand coupled with the continuous rise in cost of refined fossil fuels, their high contribution to greenhouse gas emissions and global warming, pose severe socio-economic challenges . There is thus an urgent need for the development of environmentally sustainable and affordable energy sources. One such promising environmentally friendly, affordable and sustainable alternative is bioethanol. One major advantage of bioethanol is that it results in far lower toxic gas emissions in comparison to fossil fuels such as gasoline, diesel and kerosene . With environmental protection laws in place in many countries for the implementation of bioethanol as an additive to fuel, the demand for bioethanol is rapidly increasing. Currently, ethanol blended with gasoline (e.g. gashol E5-E10 and gashol E80-85 containing 5-10% and 15-20% ethanol, respectively) is marketed in many developed economies including the USA and several European countries . Presently, most technologies for bioethanol production make use of sugar cane juice and corn starch (1st generation). Around 10-15 billion gallons are currently produced per year, far short of the projected 60 billion gallons that would be required by the world economy . Furthermore, 1st generation bioethanol production places an extensive demand on the global food market for which these carbon substrates are destined, and the production costs may be as high as 40% of revenue derived from the bioethanol . 2nd generation bioethanol produced from inexpensive, renewable substrates such as lignocellulose is believed to be an attractive, affordable and sustainable alternative. 2nd generation bioethanol production involves several sub-processes, including a pre-treatment phase, where cellulosic substrates are extracted from the raw lignocellulosic products, followed by cellulose hydrolysis or hydrolysis into fermentable pentose and hexose sugars. Subsequently these sugars are fermented by ethanologenic microorganisms including bacteria, yeasts and fungi (Figure 1). Ethanologenic bacteria are of particular relevance as they have higher growth rate than fungi, which allow them to produce more fermentative enzyme, and they can utilize both pentose and hexose sugars (few exception such as Zymomonas mobilis), while fungi rarely use pentoses [6-11]. 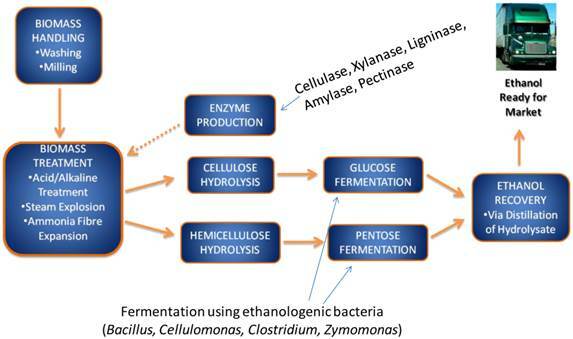 An important advantage of some bacterial strain, such as Clostridium thermocellum, is the ability to ferment cellulose directly to ethanol [12, 13, 14]. This ability opens an opportunity to use them in the consolidating bioprocessing of biomass to produce ethanol by 1 step (i.e without the need of breaking down the cellulose into its components). The alcohol by-products of microbial fermentation are subsequently distilled and dehydrated to produce an approximate 99.5% ethanol [15, 16, 17, 18]. 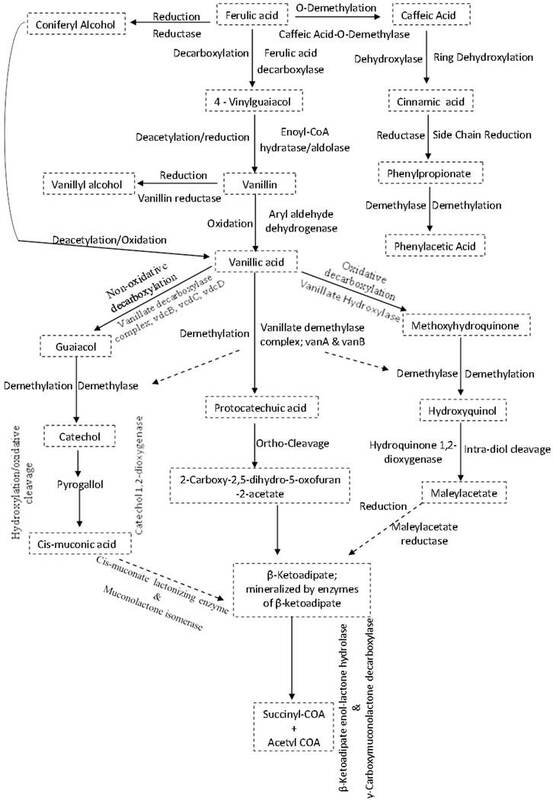 A flow chart of lignocellulose biomass conversion to bioethanol. The lignocellulose biomass is degraded into its constituent sugars by various pre-treatment methods and converted into ethanol using ethanologenic bacteria cells, which is distilled and ready for market. There are several key challenges associated with the current 2nd generation bioethanol production methods that need to be addressed in order to develop sustainable lignocellulolytic material (LCM) bioconversion into ethanol. The key challenge is the development of a robust, sustainable, cost-effective, environmentally friendly and complementary alternative to 1st generation ethanol production and fossil fuels. These include many factors that relate to the microorganisms involved in sugar fermentation, and these may include their capacity to adequately ferment sugars into ethanol, their need for additional nutritional requirements, their sensitivity/tolerance towards ethanol and organic by-products of fermentation, as well as the high temperature and low pH associated with the pre-treatment, cellulose hydrolysis and fermentation phases of the LCM bioconversion process [6, 19-23]. Furthermore, one of the major challenges associated with the current biological approach for bioethanol production is that during the pre-treatment and hydrolysis phases a number of by-products are produced that could inhibit the growth and metabolic capacity of ethanologenic microorganisms during the fermentation process [24-27]. A major goal of current research relating to LCM bioconversion is the development of effective means to reduce or eliminate the fermentation inhibitors . Several detoxification protocols have been proposed and introduced, including physical (e.g. adsorption with activated carbon or ion exchange resins), chemical (e.g. lime or alkali treatment, ionic liquids; mixtures of cationic and anionic salts that melt mostly below 100°C) or biological (e.g. laccase or peroxidise) measures [26, 29-33]. However, these methods come at an additional cost and frequently introduce further toxic waste products [30, 34]. The screening and selection of microorganisms which are highly tolerant or resistant to fermentation inhibitors may represent a more sustainable and cost-effective strategy [35-38]. In this review, we discuss the fermentation inhibitors, as well as the means by which ethanologenic bacteria may have adapted to tolerate or resist these lignocellulosic inhibitory compounds. Microbial fermentation for ethanol production involves ethanologenic bacteria as well as fungi. Several publications covering and reviewing these topics with respect to ethanologenic fungi are available [6-10, 16- 18, 20, 39- 45]. Microbial tolerance to organic solvents, other bio-products and chemicals from biorenewable fuels processes [46-48] were already discussed, however, not much of emphasis was laid on ethanolonogenic bacteria. Hence this review will focus on the effects of and tolerance/adaptation to inhibitors in ethanologenic bacteria, for which reviews are currently limited. Concise descriptions of lignocellulose as a potential source of biomass for bioethanol production and the 2nd generation bioconversion process are given. We discussed the inhibitory compounds generated during the pre-treatment and hydrolysis processes, how they affect the cellular activities of ethanologenic bacteria, as well as the mechanisms by which ethanologenic bacteria may be able to withstand and survive in the presence of these inhibitors. There have been a number of studies which have focused on the improvement of ethanol production through genetic engineering of ethanologenic bacteria. These have largely focused on yield, but not in means by which these bacteria can tolerate or resist the LCM bioconversion inhibitors [7-10]. 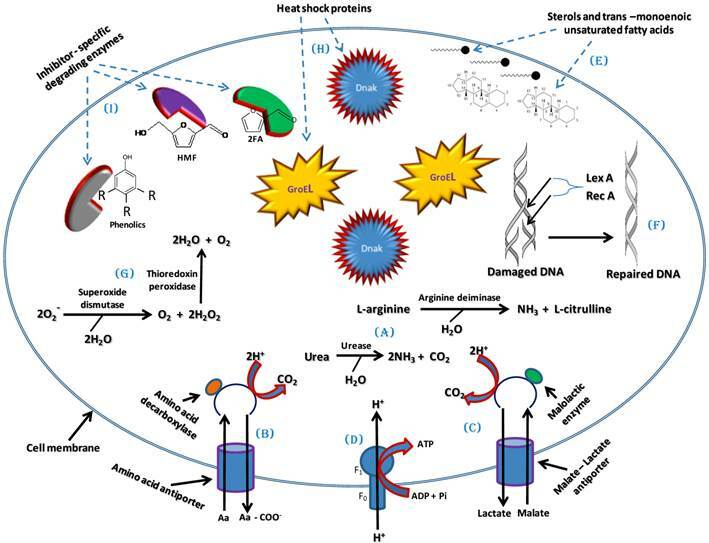 We anticipate that the topics covered in this review will be helpful in the future genetic engineering of ethanologenic bacteria with enhanced tolerance adaptation strategies towards these inhibitory substrates, thus contributing towards improvement of LCM-based ethanol production. Lignocellulose is an abundant natural biopolymer which accounts for 50% of the world's biomass. An estimated 10 - 50 billion tons of lignocelluloses is produced per annum . It can be obtained easily and inexpensively from various agricultural by products such as residual materials from grain crops, seeds, peels and shells of fruits and vegetables, vegetable oils, industrial and municipal waste, forestry residues and fast-growing energy grasses and trees [6, 49-51]. One of the major advantages of using these wastes for bioethanol production, aside from their renewable nature, will be the lower energy, environmental and economic costs associated with their disposal, as they are still considered as waste products in many parts of the world and often disposed of by burning . Lignocellulolytic materials (LCMs) consist of three main polymerized sugar components, cellulose, hemicellulose and lignin (Figure 2). Cellulose accounts for 33 - 51%, hemicellulose for 19 - 34% and lignin for 21 - 32% of the dry weight of LCM, while proteins, oils and ash make up the remaining fraction. Cellulose is the most abundant carbohydrate polymer in nature. It is composed of linear chains of hundreds to thousands of β-1,4-linked D- glucose molecules . It is closely linked with proteins, lignin, hemicelluloses and mineral elements, which makes it highly resistant to hydrolysis. However, it can be hydrolysed chemically (e.g. by acid treatment) or enzymatically (e.g. microbial cellulases) [39, 54, 55]. Cellulose is of high industrial value, being used in the production of various foods, chemicals, textiles animal feeds, pulp and paper . Hemicellulose is a branched polysaccharides consisting of pentose (D-xylose and L-arabinose) and hexose (D-glucose, D-mannose, D-galactose) sugars, uronic acids (D-glucouronic, D-galactouronic) and various o-methylated sugars . Its composition is primarily dependent on the plant source, and unlike cellulose it is more readily hydrolyzed into its component sugars . However, some of these sugars can hamper the fermentation process as many microorganisms cannot utilize them as readily as glucose . Hemicellulose is also of high industrial value, as a major source of xylose and xylitol. The latter can be used as artificial sweetener and as antimicrobial agent in foods and other household products [58-60]. Lignin, a complex aromatic macromolecule, forms an integral component of the secondary plant cell wall . It is covalently linked with cellulose and hemicellulose and provides structural support to the plant cell, protects it from hydrolytic enzymes and pathogens entry, and plays a major role in the water conductivity of vascular tissues . It is formed by the polymerization and dehydration of three monolignols (ρ-coumaryl, coniferyl and sinapyl alcohols) to form phenylpropanoids (ρ-hydroxyphenyl, guaiacyl and syringal lignins, respectively) . Products of lignin degradation such as ferulic acid, vanillin, and catechol are used in the production of herbicides, pesticides, plastics, household products, food flavourants, anti-microbial and anti-foaming agents [39, 61, 62]. The yield and productivity of LCM to ethanol bioconversion is greatly reduced due to the production of cytotoxic-inhibitory compounds generated from lignin degradation and/or sugars dehydration during the pre-treatment processes, which are subsequently released into the hydrolysate along with the fermentable sugars. The pre-treatment phase is vital for LCM bioconversion. It allows delignification of cellulose-hemicellulose-lignin complex (CHLC) that then allows possible access to hemicellulose and cellulose for subsequent enzymatic depolymerisation into simple sugars (hexoses and pentoses) . A number of different pre-treatment methods have been introduced, including acid/alkaline hydrolysis [40, 63], steam/thermal explosion and hot water treatment [41-44] and ammonia fibre expansion [45, 64, 65] (Figure 1). The type and quantity of these inhibitors is greatly dependent on the source of the biomass since lignin, one of the main sources of these inhibitory compounds, has different structural qualities and degrees of bonding/interaction with cellulose and hemicellulose depending on the plant, or waste LCM resource used for ethanol production [39, 47, 61, 62]. Furthermore, the pre-treatment processes utilized as well as fermentation variables (e.g. oxygen concentration, pH of medium, etc.) can exacerbate the toxic effectors of the inhibitors . Regardless of the source or LCM preparation methods used, three main inhibitory compounds are produced during the pre-treatment and hydrolysis steps, namely organic acids, furan derivatives and phenolic compounds [27, 30, 67, 68]. Main hydrolytic components of lignocellulose biomasses and generated inhibitory compounds. Biomasses are generated from wastes such as (A) maize cobs (B) saw dust (C) sugar cane bagasse (D) fast growing grasses. 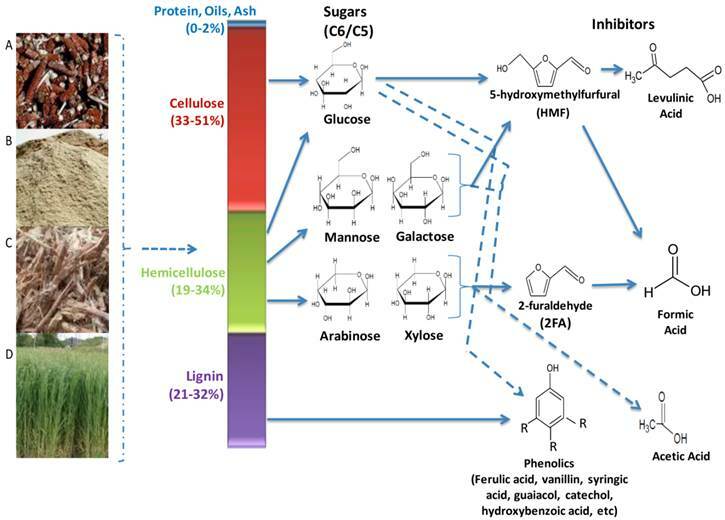 Pre-treatment processes releases the sugars (C6/C5) and lignin, however these processes also cause the breakdown of lignin and dehydration of the sugars, producing the inhibitory compounds that greatly reduces the overall efficiencies of the ethanologenic cells in the lignocellulose hydrolysate. Among the major organic acids produced during the pre-treatment and hydrolysis processes are lactate, succinate, formate and acetate . The latter, most abundant organic acid generated during pre-treatment and hydrolysis processes, is formed from the dehydration of released sugars and/or decomposition of acetylxylan, a byproduct of hemicellulose degradation (Figure 2) [63, 70]. Acetate is liposoluble and therefore diffuses across the bacterial cell plasma membrane and dissociates into its anionic form, releasing protons into the cytoplasm (Figure 3) . This result in a drop in the intracellular pH, leading to disruption of the transmembrane pH potential, various damaging anion-specific effects on metabolism, protein/enzyme activity/stability, and higher turgor pressure within the cell . The dissociation of this weak acid inside the cytoplasm results from the higher intracellular pH of ethanologenic bacteria (pH = ~7.8) compared to that of acetate (pKa =4.75). While the dissociation of acetate in the cytoplasm has a net negative effect on the microorganismal cell growth and proliferation, it does not lead to a reduction in the production of ethanol . The cells tend to rapidly generate ATP in order to maintain the intracellular pH, forcing the microorganisms to switch into anaerobic respiration, consequently generating ethanol at the expense of biomass formation . Acetate concentrations as low as 0.5g/L were reported to inhibit Escherichia coli cell growth by 50% in a batch and fermenter culture respectively, but did not result in a reduction in the cell fermentation efficiency [73, 74]. This can be linked to the bacterial cells generating more ATP in order to maintain the intracellular pH, forcing the bacteria to switch to anaerobic respiration, thereby generating ethanol, while at the same time exhausting the proton pumping capacity of the cell plasma membrane ATPase, resulting in depletion of the ATP content, dissipation of the proton motive force and acidification of the cytoplasm (Figure 3) [75, 76]. The overall effect is a reduction in cell growth and proliferation . A model of effects of inhibitors presence in ethanologenic bacteria cells. As depicted in the illustration, inhibitory effect could range from membrane disruption, lowering of intracellular pH to interference with lots of cell metabolic targets/pathways. 2-furaldehyde (furfural) and 5-hydroxymethylfurfural (HMF) are dehydration products of pentose and hexose sugars, respectively, produced during acid pre-treatment and hydrolysis of LCMs (Figure 1 and 2) . 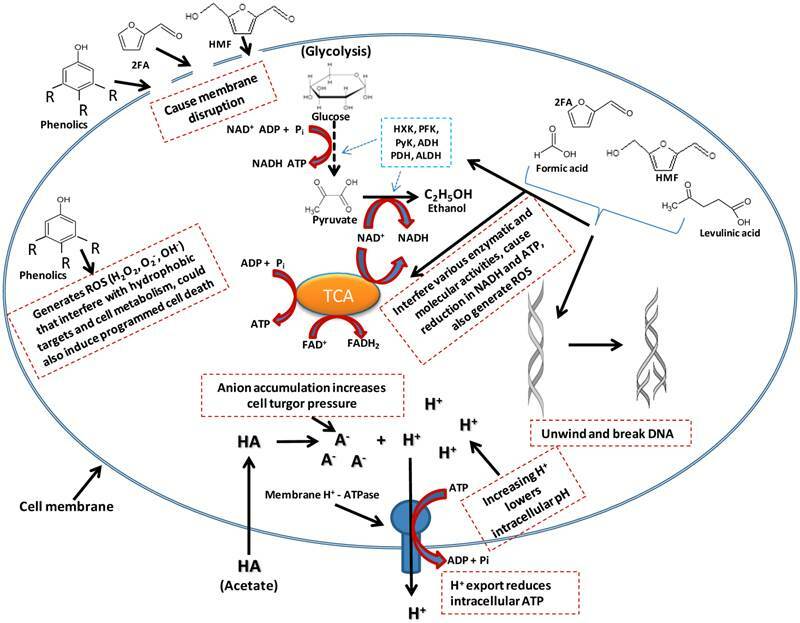 The toxicity results from the inhibition of glycolytic and fermentative enzymes essential to central metabolic pathways (such as pyruvate, acetaldehyde and alcohol dehydrogenases) , protein-protein cross linking and DNA degradation into single strands (Figure 3) [79-82]. Their high hydrophobicity allows furfural and HMF to compromise membrane integrity leading to extensive membrane disruption/leakage, which eventually will cause reduction in cell replication rate, ATP production, and consequently lower ethanol production . In-vitro incubation of furfural with double stranded lambda phage DNA led to single-strand breaks, primarily at sequence sites with three or more adenine or thymine bases [79-82]. Furan derivatives are furthermore known to act synergistically with other inhibitors including phenolic and aromatic compounds as well as acetic, formic and levulinic acids [30, 83]. The latter two acids also result as by-products of the acid degradation of HMF . Formic acid is more toxic than levulinic acid due to its smaller molecular size and undissociated form which facilitates its higher membrane permeability. Formic acid was shown to inhibit the synthesis of macromolecules, as well as DNA synthesis and repair [84, 85]. Phenolic compounds formed during the degradation lignin and dehydration of sugars in the pre-treatment and hydrolysis stages are insoluble or partially soluble in the hydrolysate and include acids (ferulic acid, vanillic acids, 4-hydroxybenzoic acid and syringic acid), alcohols (guaiacol, catechol and vanillyl alcohol) and aldehydes (vanillin, syringic aldehyde and 4-hydroxylbenzaldehyde) [61, 62]. These compounds are known to partition into biological membranes altering the permeability and lipid/protein ratio, which thus increases cell fluidity, leading to cell membrane disruption, dissipation of proton/ion gradients and compromising the ability of cellular membranes to act as selective barriers .This membrane disruption, allows the release of proteins, RNAs, ATP, Ions, out of the cytoplasm, consequently causing reduced ATP levels, diminished proton motive force and impaired protein function and nutrient transport . Furthermore, they enhance the generation of reactive oxygen species (ROS) such as hydrogen peroxide (H2O2), super oxides (O2-) and super hydroxyl (OH-) that interact with proteins/enzymes, which results in their denaturation, they damage cytoskeleton and other hydrophobic intracellular targets, cause DNA mutagenesis, and induce programmed cell death (Figure 3) . Phenolic compounds have been reported to be more toxic, even at low concentrations, than furfural and HMF [88, 89]. While the mechanism and extent of cytotoxicity of lignocellulose inhibitory compounds generally differ, they all result in gross physiological/metabolic changes in the ethanologenic microorganisms which concomitantly result in decreased cell viability and fermentation efficiency. One of the major determining factors of toxicity of these inhibitors is their hydrophobicity potentials. Hydrophobicity shows the extent to which a compound can accumulate in the cell cytoplasm. Table 1 shows the hydrophobicity potentials of the aforementioned inhibitory compounds. Log P, which is the partition coefficient of solvent in an equimolar mixture of octanol and water, is the measure of hydrophobicity (i.e the rate of interaction with non-polar molecules) [90, 91]. A high value of Log P is an indication of high hydrophobicity (i.e the coumpound can readily translocate into the cell across the non-polar cell membrane), and as a consequent, the high inhibitory the compound [90-94]. Efficient ethanologenic bacteria must be able to ferment a variety of sugars (pentoses and hexoses) and furthermore be capable of surviving, growing and replicating under the stressful conditions they will encounter during the LCM bioconversion process. This includes the ability to tolerate or adapt to inhibitors introduced during the LCM pre-treatment phases [19, 20, 95, 96]. These factors form an integral component in the screening and selection of effective ethanologenic microorganisms, as well as representing important selectable markers in the genetic engineering of ethanologenic microorganisms, be they fungi, yeasts or bacteria. The molecular mechanisms employed by these ethanologenic bacteria to counteract these compounds are still largely unknown. However, a number of specific and global stress response mechanisms have been identified in bacteria which could be used by ethanologenic bacteria to provide tolerance, resistance or protection from the many of the above-mentioned fermentation inhibitors and these will be discussed below. These include mechanisms for the maintenance of pH homeostasis and cell membrane integrity, the activation of global stress responses and inhibitor degradation. Hydrophobicity potentials of organic acids, furans and phenolics on cell physiology. Log P is the partition coefficient of solvent in an equimolar mixture of octanol and water. It is a measure of hydrophobicity, which is the rate of interaction with non-polar molecules [90, 91]. A high value of Log P is an indication of high hydrophobicity, and means the compound can readily translocate into the cell across the non-polar cell membrane, and as a consequent, the high inhibitory the compound. The Log P values of compounds were obtained from search on ChemSpider [Free Chemical Identifier Data Base; http://www.chemspider.com/]. One of the main effects of the LCM bioconversion inhibitors is the intracellular acidification of ethanologenic microorganisms . The intracellular pH can be maintained by several means in ethanologenic bacteria. One means to achieve pH homeostasis in response to cellular acidification is through the increased production of ammonia (NH3) . NH3 will combine with the excess H+ ions present in the cell upon exposure to acids produced during LCM pre-treatment to form ammonium (NH4+) ions, consequently raising the intracellular pH . Several enzymes have been identified which enable the production of ammonium, including intracellular ureases and arginine deiminase. Urease converts urea into NH3 and CO2 while arginine deiminase converts L-arginine into NH3 and L-citrulline (Figure 4A) [98-100]. Furthermore, the activation of an amino acid decarboxylase coupled with an antiporter, pumps in amino acids (arginine, glutamate or lysine) and pumps out decarboxylated products (agmatine, γ-amino butyrate or cadaverine) from the bacterial cell. This results in the expulsion of 2H+ molecules per decarboxylated product and leads to increase in intracellular pH (Figure 4B) [97, 100]. This mechanism was well studied in Escherichia coli where glutamate-dependent decarboxylation was shown to be the most robust, in terms of pH stabilization, while the lysine-dependent decarboxylation is the least effective [97, 101]. In addition to this effect, malolactic enzyme which converts mono-anionic malate into lactate by the addition of 2H+ can also contribute towards reducing the intracellular H+ concentration (Figure 4C) . The results of these decarboxylation processes concurrently generate a proton motive force (PMF) that is sufficient to drive ATP synthesis via F1-FO ATP Synthases activity, as a result providing ATP for metabolic functions (Figure 4D) . The hydrophobicity of the inhibitors results in the interference with fluidity and rigidity and concomitant instability of the bacterial cell membrane. One means to cope with this instability is by increasing sterol production and altering phospholipid fatty acids through synthesis of more trans-monoenoic than cis-monoenoic unsaturated fatty acids [102-104]. This enhances membrane restructuring, conferring higher rigidity and resistance to disruption by external factors such as LCM bioconversion inhibitors (Figure 4E). This has been demonstrated in Pseudomonas putida P8 as well as several other bacteria belonging to the genera Pseudomonas and Vibrio which are resistant to high concentrations of phenolic compounds, and is linked to the constitutively expressed periplasm-localized enzyme cis-trans isomerase (Cti), which converts cis-unsaturated to trans-unsaturated fatty acids. [105,106]. Sterols ensure that the bacterial cell membrane provide a greater hydrophobic barrier against polar molecules and rigidity barrier against non-polar molecules, consequently blocking non-specific translocation/permeation of toxic molecules into the cell [104, 105, 107]. Bacterial Outer Membrane Proteins (OMPs) located in the outer membranes of Gram-negative bacteria and cell envelopes of Gram-positive bacteria may also play a vital role in providing a protective barrier against the influx of LCM bioconversion inhibitory compounds and/or facilitate their efflux through the plasma membrane, consequently protecting the cell [108-110]. The role of OMPs in the extrusion of and protection against phenols has been described in both Pseudomonas species and E. coli [111 - 113]. Given the physiological stress introduced by LCM bioconversion inhibitors on bacterial cells, another means by which bacteria can tolerate these inhibitors is through the activation of global stress responses. Sigma factors (σS and σB) that regulate the general stress responses in bacteria play a major role in initiating the transcription of vital stress response genes [114-117]. They form a complex with RNA polymerase that binds to the promoter regions of these response genes resulting in their transcription and subsequent translation. Activated response genes include those encoding SOS response proteins such as LexA and RecA which participate in various housekeeping functions including DNA repair and correction of mutation errors (Figure 4F) [ 118, 119], oxidative stress response proteins such as superoxide dismutase (which converts O2- to O2 and H2O2) and thioredoxin peroxidase (which converts H2O2 to H2O) thus relieving oxidative stress (Figure 4G) [117, 120], and heat shock proteins/chaperones (DnaK and GroESL complex) which are involved in the folding, renaturation and stability of cellular proteins or removal of damaged proteins during stress (Figure 4H) [117, 120, 121]. Other regulators that could play similar role as the sigma factors are stress tolerance-related transcriptional factors such as Hfq, NhaA and HimA [122-124]. These transcriptional factors were shown to be involved in the regulation of genes involved in resistance to lignocellulosic pre-treatment inhibitory compounds in Zymomonas mobilis. Over expression of the hfq, nhaA and himA genes resulted in increased resistance to these inhibitory compounds, while knock-out mutants were more sensitive [122-124]. A model of tolerance and adaptation mechanisms which could be employed by ethanologenic bacteria against the effects of lignocellulose inhibitors and which may involve maintenance of pH homeostasis and cell membrane integrity, activation and regulation of global cellular stress responses and degradation of Inhibitors. The synthesis and activation of proteins such as enzymes or co-enzymes in inhibitor-specific degradation pathways can contribute significantly towards alleviating the negative effects of the inhibitors on ethanologenic bacteria (Figures 4I and 5). The degradation of these inhibitory compounds has been widely demonstrated in many bacterial species, particularly for phenolics, where meta/ortho-cleavage and β-ketoadipate pathways are used for phenolic compound degradation [125-128]. Phenolic degradation pathways have been previously described in Gram positive bacteria genera, such as Aerobacter  Arthrobacter , Bacillus [131-135], Lactobacillus [136, 137], Rhodococcus  and Paenibacillus , as well as in Gram negative bacteria genera such as Acinetobacter , Comamonas [141, 142], Enterobacter , Escherichia [144-148], Klebsiella , Pseudomonas [150-153] and Sphingomonas [154, 155]. It has been shown that these microorganisms have evolved with abilities to degrade phenolics such as ferulic acid, vanillic acid, protocatechuic acid, and catechol, and be able to break them down into simple products via series of enzymatic processes, which can then channelled into the TCA and/or glyoxylate cycle(s) to produce energy (Figure 5) [125-128, 131, 139, 147, 150]. Mechanisms such as decarboxylation, demethylation, dehydroxylation, oxidation, ring-cleavage, reduction, deacetylation are employed by several of the above-mentioned bacteria to degrade phenolic compounds. This degradation involves specific enzymes such as ferulic acid decarboxylase, vanillate demethylase, catechol-1,2-dioxygenase, maleylacetate reductase, muconolactone isomerise, β-ketoadipate enol-lactone hydrolase, γ-carboxymuconolactone decarboxylase (see Figure 5) [125-128, 131, 139, 147, 150]. The conversion of the aldehyde and/or carboxylic acid groups of phenolic compounds to alcohol group compounds were shown to be more beneficial to the cell physiology [76, 86], probably due to the reduced toxicity of the alcohol functional groups. The enzyme carboxylic acid reductase in Nocardia sp. was shown to convert the phenolic compound vanillic acid to vanillin aldehyde , while an aldehyde reductase in Gluconobacter oxydans can convert this aldehyde to vanillyl alcohol . The enzyme furfural reductase produced by many different ethanologenic bacterial species can degrade furfural and HMF to the less toxic compounds furfuryl and hydroxymethyl furfuryl alcohol respectively [158, 159]. It was shown that NADPH concentration plays a vital role in the activity of this enzyme, and that NADPH-dependent reduction of the furan compounds competes with normal cell metabolic biosyntheses that utilise NADPH . The silencing of the NADPH-dependent oxidoreductase genes yqhD and dkgA in E. coli EMFR9 resulted in greater tolerance towards furfural and HMF [160, 161]. This was attributed to the increased availability of NADPH for use by furfural reductase, as over expression of glucose 6-phosphate dehydrogenase in S. cerevisiae that produces NADPH, was found to enhance tolerance to furfural . Genetic manipulation of four genetic traits (FucO, ucpA or pntAb and deletion of yqhD), were recently shown to increase furfural tolerance in ethanol producing E. coli LY180 (Strain W; ATCC derivative) and in succinate biocatalyst E. coli KJ122 (Strain C; ATCC8739 derivative) . These strains were reported to be highly resistant to furfural and mixture of other hemicellulose derived inhibitors, as equal yields of ethanol and succinate were produced when these strains were used in hemicelluloses hydrolysates (which contain furfural, HMF, formic and acetic acids) and in laboratory controlled fermentations . The introduction of Laccase, a multicopper oxidase enzyme, in willow plant hemicellulose hydrolysate has also been found to greatly reduce the effect of lignocellulose inhibitory compounds (such as vanillic acid, catechol and 4-hydroxybenzoic acid) on fermentation . Laccases are produced by many bacterial species, including Azospirillum lipoferum [165, 166], Bacillus subtilis [167, 168], Marinomonas mediterranea [169, 170], Streptomyces griseus and Streptomyces cyaneus [171-173], where it participates in the biodegradation of polymers and ring cleavage of aromatic compounds. The development of sustainable biofuel production will require an efficient utilization of alternative renewable and inexpensive biomass sources, such as LCMs. Presently, the large-scale use of bioconversion of LCMs to ethanol is hampered by the introduction of inhibitory compounds during the pre-treatment steps which negatively affect the ethanologenic microorganisms used for downstream ethanol production. There is thus an urgent need to improve and optimize the LCM pre-treatment and hydrolysis processes in order to overcome this technical challenge and thereby improve the fermentation efficiency [29, 54, 174]. Existing chemical or physical strategies for inhibitor elimination or reduction are expensive and not entirely effective. Hence it has become important to look at means to improve the tolerance/resistance of ethanologenic microorganisms, including bacteria. This can be undertaken by screening for inhibitor tolerant/resistant microorganisms or through genetic engineering. Inhibitor-specific degradative pathways in bacteria cells. Mechanisms often used by specific enzymes may involve decarboxylation, demethylation, dehydroxylation, oxidation, ring-cleavage, reduction, deacetylation e.t.c. The products formed are often less toxic to cells physiology and could easily be metabolised further to form products such as acetyl and succinyl COA that are easily assimilated by the cells. An important conventional biological approach which involves long-time course adaptation study could be employed. This could be done by culturing ethanologenic bacteria in specific medium containing high concentrations of LCM inhibitory compounds with low carbon (sugar) source, allowing them to adapt and develop in the new environment. This approach will lead to creation of inhibitor-tolerant bacterial strains, in a way that strains that have the ability to survive, grow and adapt within this medium, would have activated specific proteins/enzymes and mechanisms that would have facilitated the transformation of the LCM inhibitory compounds present in the hydrolysates, into less toxic compounds. This approach has resulted in increase in microbial biocatalysts efficiency in production of ethanol with increasing tolerance to LCM inhibitory compounds. For example, the Escherichia coli LY01 strain was found to show high tolerance to toxic aldehydes than its wild type KO11, by expressing high levels of genes involved in safeguarding osmolytic balance, stress response proteins and cell envelope components [76, 175]. Furthermore, Escherichia coli strain LY168 engineered from wild type K011 from was shown to produce higher level of ethanol in a minimal nutritional supplement from various lignocellulose biomass containing LCM inhibitory compounds . It also shown that Methylobacterium extorquens, Pseudomonas sp., Flavobacterium indologenes, Acinetobacter sp., Arthrobacter aurescens could also degrade LCM inhibitory compounds when grown on them as the sole carbon and energy sources .The success of this approach infers that it could be applied to other ethanologenic bacteria to improve the overall tolerance to LCM inhibitory compounds and fermentation efficiencies. Resequencing the genome/proteome of these strains will also provide valuable information into the adaptation mechanism that may have been employed by these strains in adjusting to the new environment. Another approach could be use of enzymatic detoxification. The use of laccase, phenoloxidase and/or lignin peroxidase enzymes could be a great potential, since treatment of LCM hydrolysate with these enzymes have led to degradation of phenolic compounds and increase the ethanol yield with a negligible loss of total sugars [ 178-180]. Using appropriate genetic engineering to over-express the active production of these enzymes has been successfully carried out in S. cerevisiae [181-186]. It will therefore be of better advantage if the same technology could be used for ethanologenic bacteria cells, since they have the abilities to grow quickly, producing more of these enzymes and they also could successfully ferment both C6 and C5 sugars in the LCM hydrolysate, unlike most fungi that ferment C6 and rarely utilize C5 sugars. Over-expression of homologous and heterologous potentially beneficial genes of dehydrogenases and reductases enzymes that are involved in numerous detoxification reactions and which are shown to alter the levels of co-factor NADPH and NADH could also confer resistance towards specific LCM inhibitory compounds [187, 188]. Furthermore, the use of genomics/metagenomic approach in biomining varieties of environmental and industrial niches for lignocellulolytic bacteria with genes that confers resistance or ability to degrade these inhibitory compounds, which could be cloned and expressed in existing industrial strains (that have high ethanol production capabilities) could further enhance the current fermentation technologies [189, 190]. These bacteria are able to survive extreme habitats such as thermophilic, halophilic, acidophilic or alkaliphic environments as a result of their innate defence and adaptation mechanisms, and they often produce enzymes that are activity and potentially stable at these harsh conditions, which are often similar to extreme conditions present in lignocellulose degradation processes. Such bacteria could be used concurrently with the ethanologenic strains; helping to degrade the inhibitors while the ethanologenic bacteria ferments the hydrolysate . As example, the use of thermophilic bacterium, Ureibacillus thermosphaercus was found to potentially increase ethanol production when used concomitantly with S. cerevisiae for ethanol production in waste house wood hydrolysate . Phenolics and furan derivatives present in the hydrolysate were confirmed to be degraded by Chromatographic analysis, and the bacterium grows fast and utilizes below 5% of the released fermentable sugars. It is anticipated that in the near future green energy such as biofuels (bioethanol in particular) will gradually replace fossil fuels as a global energy source  for home and industrial use. However, more vigorous research and focused approaches must be channelled into the development of robust and economical technologies that will utilize lignocellulose biomasses on a larger scale and improve lignocellulose fermentation efficiencies. This could be achieved by overcome the existing challenges facing the fermentation processes through better understanding of mechanisms of hydrolysate toxicity and engineering tolerance towards them. If this is actualized, lignocellulolytic biomass fermentation will be able to meet and exceed the productivity of sugar/food crop-based bioethanol bioprocesses that threatens world food security. The further advancement of lignocellulose biotechnology will not only provide bioethanol for energy use, but will also create other opportunities to the world economies in terms of providing cheaply valuable raw materials for various industrial uses and reducing the burden of disposal of these biomasses, creating a cleaner, greener, and a comfortable, friendly environment [50, 51, 193]. Moreover, the successes of USA and Brazil in food crop-based bioethanol production have proved that the same could be achieved with use of lignocellulosic biomasses if the appropriate technologies are put in place . The authors wish to thank by the National Research Foundation (NRF) South Africa, the University of Western Cape and the Agricultural Research Council of South Africa, for their institutional and financial support. Corresponding author: Professor Bongani K. Ndimba. Proteomics Research and Services Unit, Agricultural Research Council/Infruitech & The University of the Western Cape, Biotechnology Department, Private Bag X17, Bellville, Cape Town, South Africa. Email: ndimbabagric.za, bndimbaac.za Fax: +27 21 959 1551.